SiriusXM has announced that Joe Bonamassa will host a new weekly show, Different Shades of Blue with Joe Bonamassa, on B.B. King's Bluesville channel. The new show will feature Bonamassa exploring all aspects of the blues genre and curating his favorite blues songs in an eclectic mix. 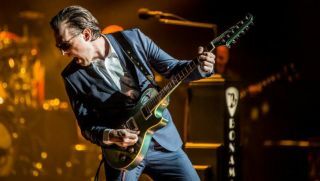 Said Bonamassa, "I am really excited to launch my show on SiriusXM's B.B. King's Bluesville. Hosting and sharing music with people is one of my passions. I hope everyone enjoys it as much as I do, bringing this new show to you." The new weekly show will also feature "Keeping the Blues Alive Spotlight," where Bonamassa will share select tracks from emerging blues acts to showcase inspiring new music from younger generations. The segment coincides with Bonamassa's foundation of the same name, Keeping the Blues Alive, which promotes “music education for the next generation,” donates instruments to schools across the country, funds scholarships for college education and more. Different Shades of Blue with Joe Bonamassa premieres on Monday, January 21 at 6:00 pm ET on B.B. King's Bluesville, via satellite on channel 74 through the SiriusXM app on smartphones and other connected devices, as well as online.